Does your cat love to play outside but needs a space where they can be protected from the elements? They need their very own outdoor cat house to help them stay warm in the winter and cooler in the summer! The question is, which model is the best outdoor cat house? Don’t waste a penny on outdoor cat houses that can’t compete with some of the best available models. 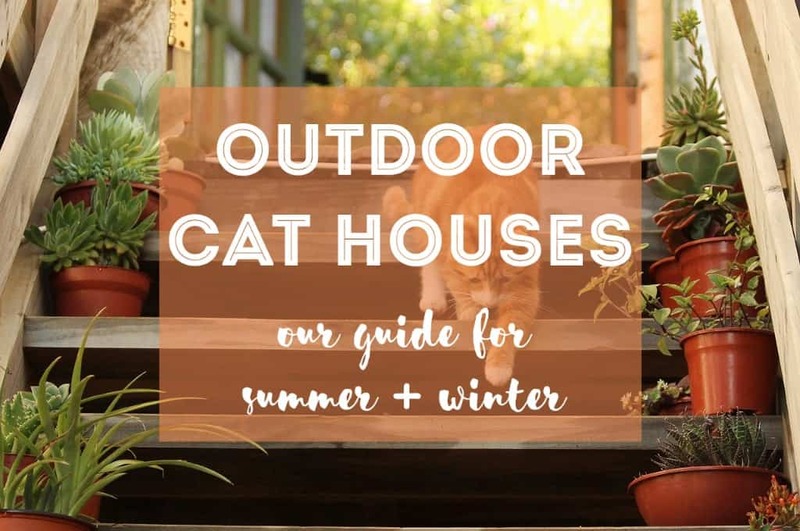 Our guide to the best outdoor cat house will show you everything you need to know! 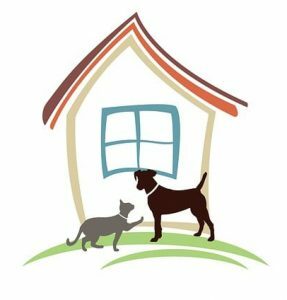 When it comes to purchasing an outdoor cat house, many pet owners hesitate on which features are the most important. They want their feline to be cool, comfortable, and safe in the summer. However, they also need to be equally comfortable, warm and secure during the harsher winter months. What features should you ultimately look for when it comes to purchasing an outdoor cat house? Here are just a few of the important features you want to keep an eye out for when shopping. Easy Assembly: Are you pretty handy with a hammer and nails? Most pet owners want something that they can put together quickly without the need for extensive instructions. Look for pre-drilled holes and snap-together pieces. Heated Features: If you live somewhere where freezing temperatures are the norm during the winter months, having a heated outdoor cat house is going to be the best option. You want to evaluate how much energy it uses and just how comfortable the heating pad or cat bed is going to be for your feline. Insulation: Insulation serves dual purposes: it keeps your cat cool in the summer and warm in the winter. In particular, you should look for thick walls or R-value insulation. Escape Door: What would happen if your cat was attacked by a predator while situated comfortably in their outdoor cat house? Some models have an extra back door escape that can allow your cat to run free instead of becoming trapped by neighborhood dogs or worse. Once you know what to look for, it’s time for you to survey the best available options on today’s market. Here are three of the best candidates for the top outdoor cat house! 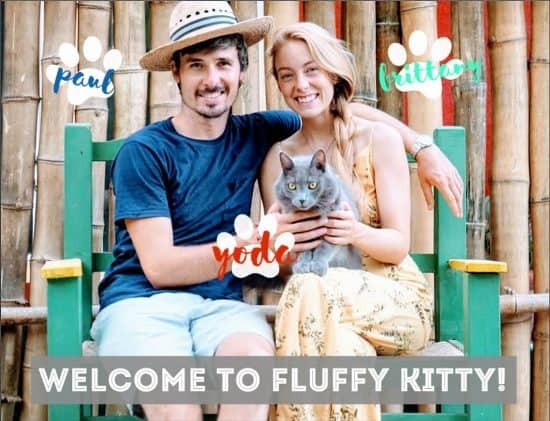 If you’re looking for a comfortable and insulated outdoor home for your beloved kitten, then the Kitty Tube Gen 3 Outdoor Cat House with Custom Pet Pillow is bound to be the right choice. The walls and floor are both insulated with R-value insulation to keep your cat cool in the summer and warm in the winter. The custom pet bed inside the primary dome is fully machine washable and fits comfortably over the top of the insulated floor. Your cat will love laying on the padded area as they stay protected from the outdoor elements. Additionally, it has a removable clear flap floor to make cleaning out the inside of the cat house easier than ever. 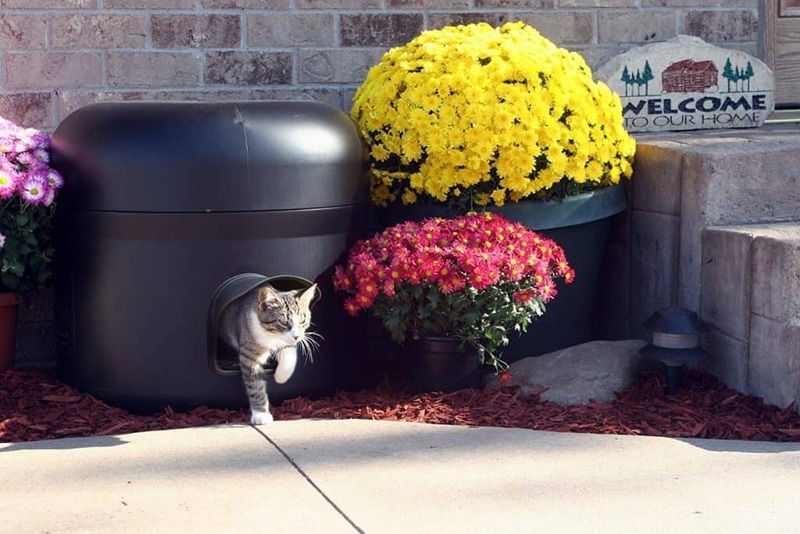 According to the inventor of the Kitty Tube, the entrance of the tube is too small and is uniquely shaped to fit your feline. This prevents true predators of cats from being able to enter the tube, securing your cat inside in the event of an attack. Dogs and coyotes are both too large to fit through the opening. One of the best things about the Kitty Tube Gen 3 is that it is constructed from post-consumer recycled content and made in America. It has a lifetime guarantee never to chip, crack, or fade away. Your investment is well-protected. Does it get too cold where you live to fathom allowing your cat outside without heat? When the temperatures drop to freezing, the K&H Pet Products Outdoor Multi-Kitty Heated A-Frame might be your best option. The heated portion of the shelter uses very little electricity for its soft, heated bed at just forty watts. Additionally, it requires no tools to assemble this advanced-looking shelter. This heated shelter is both waterproof and weather-resistant, making it ideal for even the harshest climates. Keep in mind that safety should be your top priority when it comes to selecting the best outdoor cat house. This shelter features two exits so that your felines can easily escape if a predator comes their way. Up to four cats can use this outdoor cat house comfortably at one time. It also comes standard with a one-year warranty. 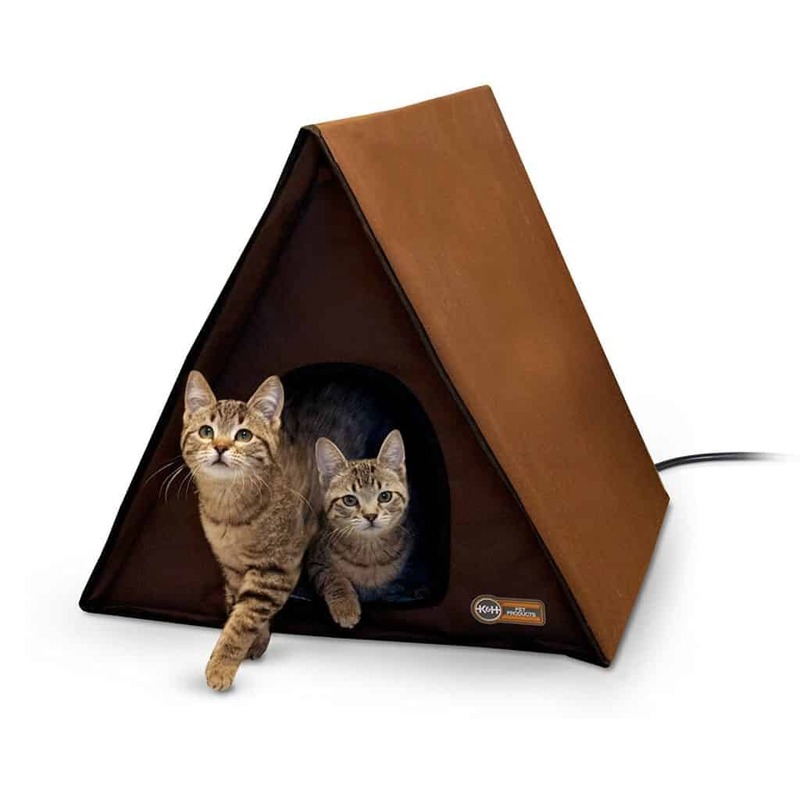 The K&H Heated A-Frame outdoor cat house is also highly-rated. It has one of the most reasonable prices for a heated cat house, although prices are subject to change. See buying options for details. Does your cat love to play around outside? 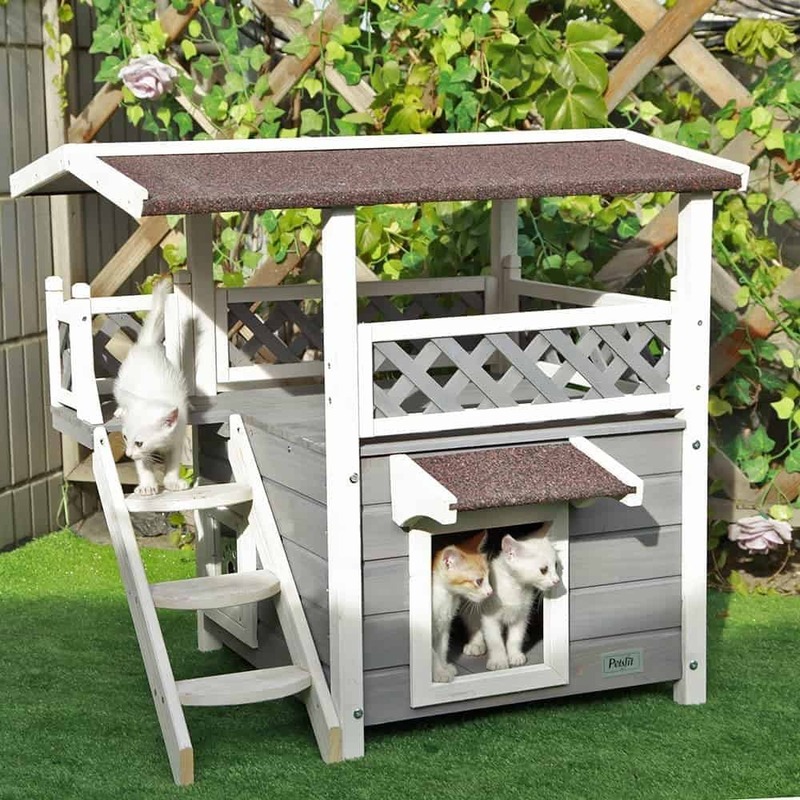 This 2-Story Outdoor Weatherproof Cat house from Petsfit is the ideal option. The stairs allow your cats to frolic and play between the protected cat house below and the balcony above. Instead of stairs, you can even opt for a scratching post to engage all of your cat’s instincts at the same time. This is one of the most playful options available for cats who want to explore the outside world without venturing too far from home. The walls of the cat condo are constructed of 12-millimeter-thick cedar wood that stands up well to the elements. In a test by the manufacturer, it was proven that this cat house should last for a minimum of three years in the great outdoors when treated properly. There is a secondary escape opening to help protect your cat in the event of an attack. The pre-drilled holes make assembling and setting up your new outdoor cat house simpler than ever before. It comes fully painted so that all you have to do is slip a few pieces together before your cat house is complete. Unfortunately, this is not a heated option but you could easily add a heat mat inside for colder weather. Are you ready to give your feline some protection while they explore the outside world under your watchful eye? These outdoor cat houses should give them the security and shelter that they need in order to explore. Decide which features are the most important to you to determine which one is going to be the best outdoor cat house for your feline. Great reviews and ideas, thank you – this article was very helpful.